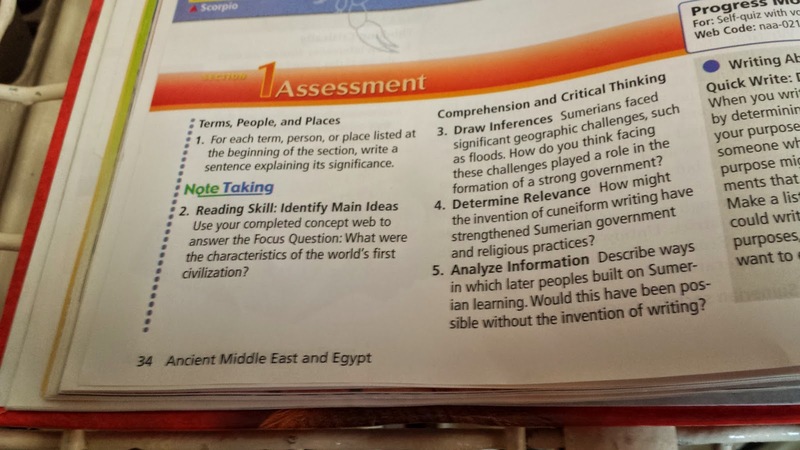 NYC Educator: How Soon Will It Be Before CCSS Branding Becomes Obsolete? How Soon Will It Be Before CCSS Branding Becomes Obsolete? 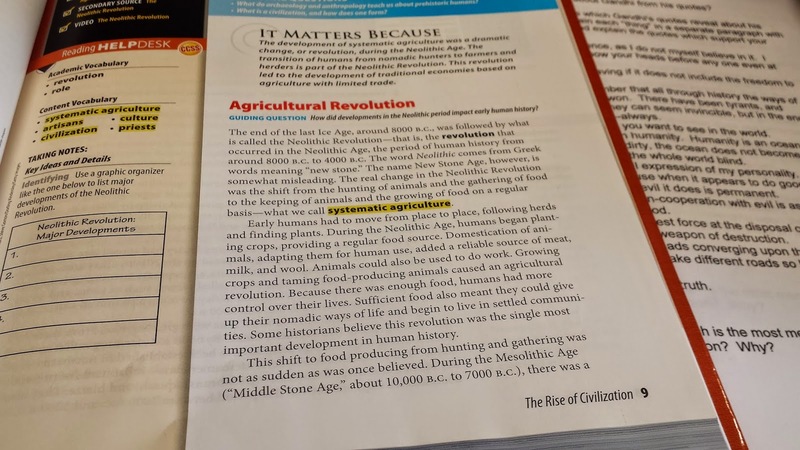 Do you use any of the new CCSS textbooks? We had a sample copy in our workroom. Due to factors of cost, most of our texts appear to be created ten-years ago. 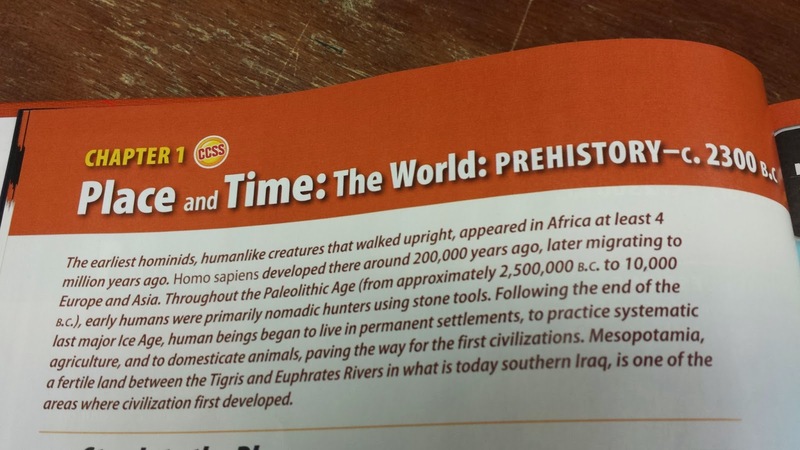 The CCSS texts don't seem significantly different from the older texts. History hasn't changed much. Both books have questions for critical thinking at the end of each section. It doesn't seem to me that there is any great difference in the level of the questions. Perhaps, it's just me. 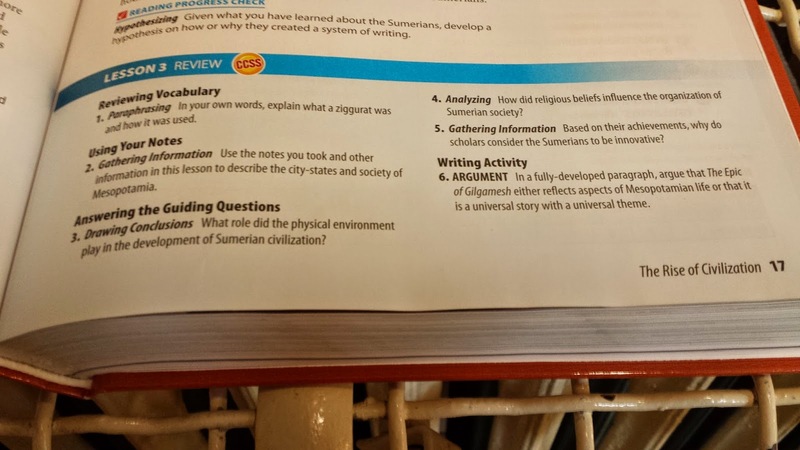 A CCSS question page. 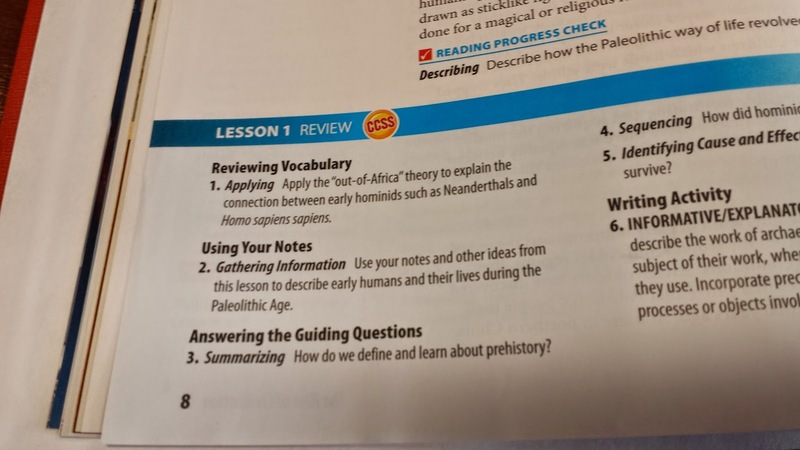 Notice the branding next to the word "REVIEW"
I don't have the official formula to measure the lexile level (and if I did, I wouldn't use it), but compare two pages with similar content, a discussion of cuneiform. Although the books may differ slightly in the information provided to the reader, I do not recognize one as superior to the other. 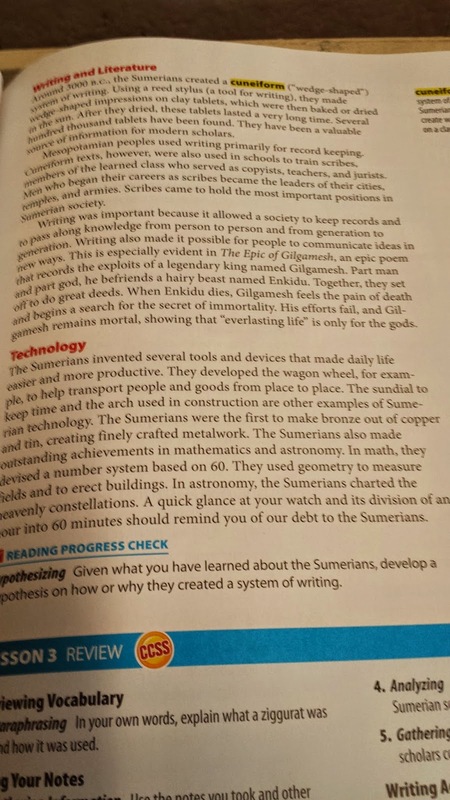 Both texts even discuss Gilgamesh. 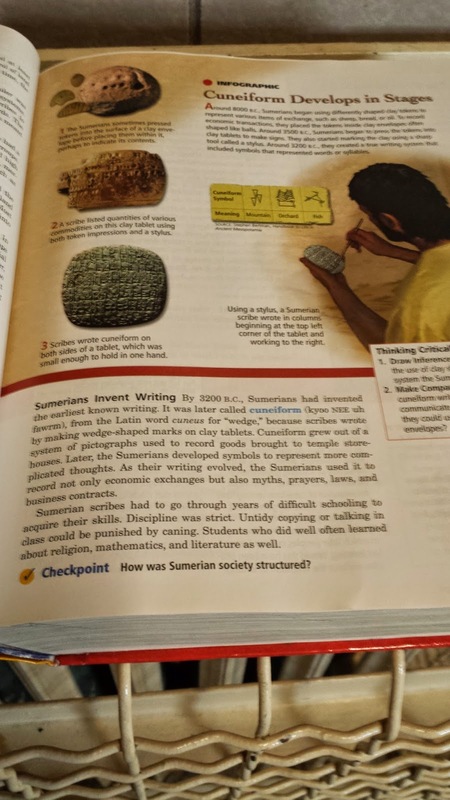 In my classroom, at some point, we look at cuneiform symbols. We compare them to the symbols of other early writing systems. 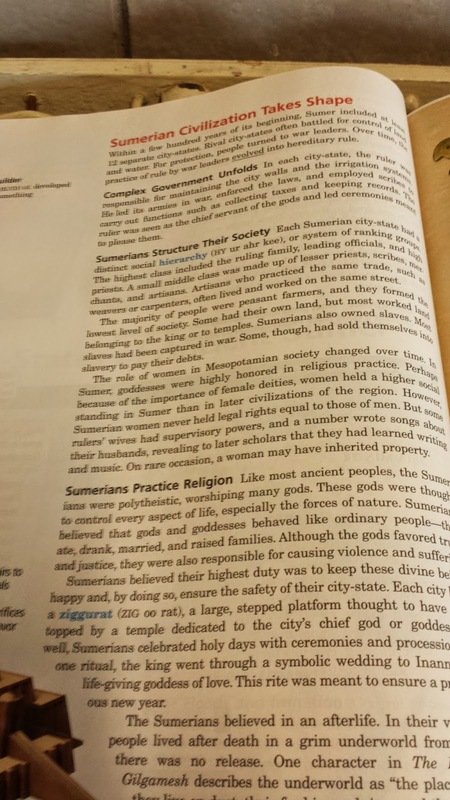 We read a primary source on a child's day at school in Sumer and a summarized version of Gilgamesh. It may seem like I have always been Common-Core aligned. No, it's just good teaching. No branding necessary. Keep your Pearson tests with cut scores set just so. Where the two books seem the most different is in their branding. Notice so many of the pages of the new text contain the CCSS emblem, the educational equivalent of FDA- or Gates-approved. CCSS label appears next to the "HELP DESK" above. Help! My hope is the Core can be killed before the City has to purchase loads of these bogus texts, touting college and career readiness above and beyond the days of old. It is so unpopular in my circles, the sooner CCSS becomes obsolete, the better. Perhaps, in the case of the textbooks, given the influence of business upon education, it is just another case of planned obsolescence. Who Will Be the Teachers of Tomorrow?